Barbershop singing is a distinctive and under-documented facet of Britain's musical landscape. Imported from the USA in the 1960s, it has developed into an active and highly organized musical community characterized by strong social support structures and a proselytizing passion for its particular style. This style is defined, within the community, in largely music-theoretical terms and is both highly prescriptive and continually contested, but there is also a host of performance traditions that articulate barbershop's identity as a distinct and specific genre. Liz Garnett documents and analyses the social and musical practices of this specialized community of music-makers, and extends this analysis to theorize the relationship between music and self-identity. The book engages with a range of sociological and musicological theoretical frameworks in order to explore the role of harmony, ritual, sexual politics, performance styles and 'tag-singing' in barbershop. This analysis shows how musical style and cultural discourses can be seen to interact in the formation of identity. 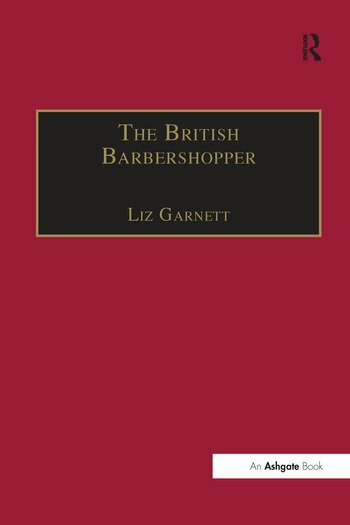 Garnett provides the first in-depth scholarly insight into the British barbershop community, and contributes to ongoing debates in the semiotics and the sociology of music. Contents: Introduction: barbershop singing in the UK; Ethics and aesthetics: the social theory of barbershop harmony; The procedures of preservation: barbershop singing and the invention of tradition; Ridicule, religion, and the public image of barbershop; Separate but equal? Sexual politics in the barbershop; Performance mannerism and the amateur imagination; Tag-singing: the private face of barbershop; To 'be' a barbershopper: theorizing music and self-identity; Conclusion: beyond barbershop; Glossary; Bibliography; Index. Dr Liz Garnett is a musicologist and choral clinician whose research and praxis both explore the theme of music and its social meanings. She has held academic posts at Colchester Institute and Birmingham Conservatoire, and is in demand internationally as a performance coach and arranger. Her first book, The British Barbershopper: A Study in Socio-Musical Values, is also published by Ashgate.